CHELMSFORD, Mass. – September, 2013 – Axis Communications, the world leader in network video surveillance, today announced version 2.10 of the popular and award-winning AXIS Camera Companion software, an easy-to-use digital surveillance solution for installations of 16 cameras or less. The new version of the free software client offers additional features to improve usability, mobile viewing and storage options, and will be on display from Sept. 24-26 in Chicago at ASIS International in Axis’ booth #1034. AXIS Camera Companion 2.10 includes support for 360° overview recording with de-warped views when zooming into the image. This allows users to take advantage of the benefits from Axis’ 360° fixed dome HDTV cameras, providing great overview and scene details with only one camera. 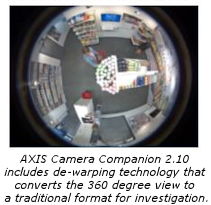 See demo movie showcasing the 360° and de-warped views in AXIS Camera Companion. While most AXIS Camera Companion solutions record video directly to SD-cards inside Axis network cameras, the new release also includes support for easier integration of network-attached storage (NAS) when increased storage capacity is needed. A set-up wizard makes it possible to integrate any NAS device on the market and, for further simplicity, Axis has included automatic configuration in the software client for select NAS products. Unlike traditional surveillance installations, AXIS Camera Companion does not require a central recording device – such as a digital video recorder (DVR), network video recorder (NVR) or even a computer – to run. All video can be recorded onto a standard SD-card in each camera, and the cameras keep recording even if the network fails. The cameras can be powered over the network, eliminating the need for separate power cables. These three factors reduce cost, simplify installation and make the system more robust with no single point of failure. To further protect customer’s investments, existing analog cameras can be integrated via video encoders. The new AXIS Camera Companion 2.10 software client is available for free download at http://www.axis.com/products/cam_companion_software/index.htm.